Decorated inventor of the first solid-state electronic dimmer switch, Joel Spira passed away on Wednesday at the age of 88 in his Bucks County, PA home. He died of natural causes, according to a report by The Morning Call. 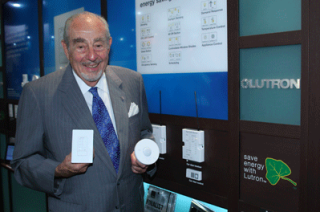 Joel Spira in 2010, holding the Lutron seeTemp thermostat (left) and Radio Powr Savr occupancy/vacancy sensor. An industry pioneer in the truest sense, 12 of his inventions are curated in the Smithsonian Museum in Washington, DC, alongside of those of Thomas Edison. He founded Lutron in 1961 after developing a way to reduce the output of light bulbs, which led to his invention of the Capri model solid-state dimmer, the world’s first such device. The company has since grown into one of the world’s leading manufacturers of lighting devices and controls, holding some 2,700 patents around the world. An innovator ahead of his time, he and his company laid some of the earliest foundations for energy conservation. An industry trailblazer, his inventions led the way for the entire home automation business. For his contribution to the field, CEDIA honored him with a Lifetime Achievement Award in 2012. “Our thoughts and prayers go out to Joel’s wife Ruth, and his entire family. As the founder of Lutron Electronics, Joel created a business focused on the customer experience and benefiting society. He not only patented the electronic light dimmer but developed an entirely new industry dedicated to lighting control. His profound influence affects all of us in the Lutron family and encourages generations of young engineers, scientists, and designers to become innovators in lighting control and in the fields of engineering and physics. His innovations not only save energy, but also make people’s lives better by creating residential and commercial spaces that are more comfortable and more pleasant,” said Michael Pessina, president of Lutron Electronics, in a statement. Joel Spira: "It’s just tremendous…"